Want to improve your overall health and wellness? Workout every day. 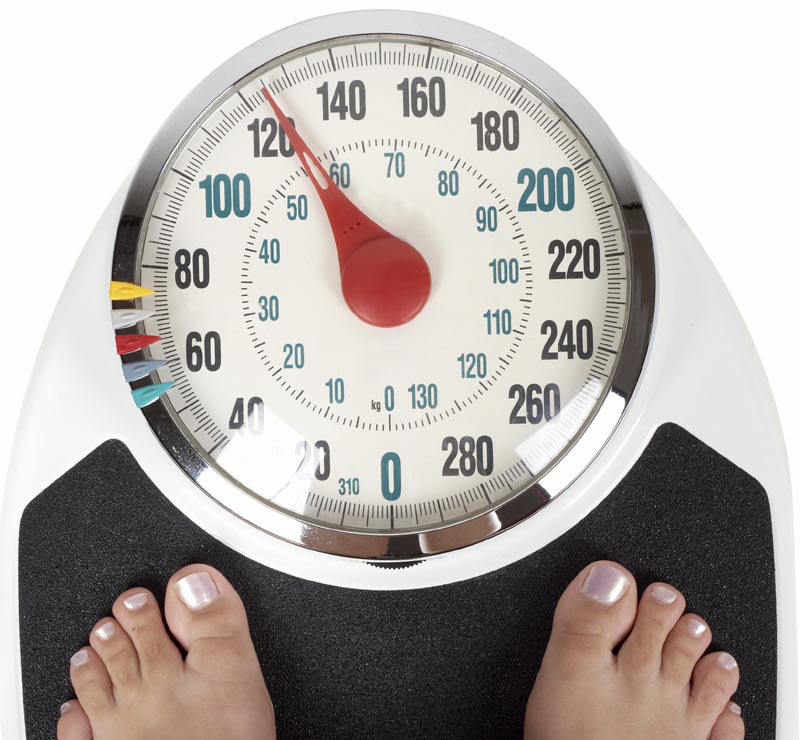 Weight Management: Regular exercise helps to accelerate metabolism, burn calories, and maintain an ideal weight. Health and Wellness: Regular exercise can help prevent heart disease, high blood pressure, and high cholesterol. In fact, regular physical activity can help you prevent or manage a wide range of health problems and concerns, including stroke, metabolic syndrome, type 2 diabetes, depression, certain types of cancer, arthritis, and falls, according to experts from the Mayo Clinic. Improve Mood: Physical activity stimulates various brain chemicals that may leave you feeling happier and more relaxed. You may also feel better about your appearance and yourself when you exercise regularly, which can boost confidence and improve self-esteem. More Energy: Regular exercise can improve muscle strength, boost endurance, and help your cardiovascular system work more efficiently. Better Sleep: Regular physical activity can help you fall asleep faster and deepen your sleep. Ease of Movement: Weight-bearing exercise strengthens muscles and joints, improves range-of-motion, and improves the efficiency with which you move. Don’t worry about how much you lift or how strong you are, just find activities you enjoy and keep moving. I try to exercise six days a week, usually by strength training (3-4 days) and playing basketball (twice weekly). Since I workout at the facility I own and operate, there’s rarely an excuse to miss a day (not that I haven’t). But basketball isn’t always an option, since our group plays at the local middle school. When school is not in session (holidays, summer, etc.) the gym is closed, which means no basketball. If I can’t play basketball I’ll do something different. 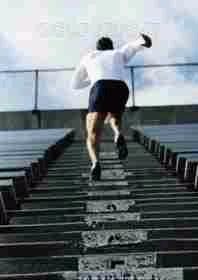 I’ll run some sprints, intervals, or stadium stairs. I’ll go for a bike ride, jump rope, or swim some laps. They’re not necessarily my favorite activities, but I’d rather do something than miss exercising. Your activity doesn’t need to be anything athletic or overtly exercise related, just do what you enjoy. Walk your dog or work in the garden. Get started on that home improvement project. When you shop at your local mall, take the stairs instead of the elevator or escalator. The point is… just keep moving. The benefits of exercise and physical activity are indisputable. Regular exercise can improve strength, mobility, balance, coordination, fitness, health, wellness, energy level, mood, sleep, and confidence. Yet, despite all these benefits, the majority of people in our country — children and adults — don’t get adequate, regular physical activity. It’s too difficult. Sadly, a lot of advertising for fitness-related products and programs have taken it to an extreme. In these cases, the standards for fitness have become elevated in such a way that too much focus is placed on what your body can’t do, rather than what it can do. One does not need to aspire to body builder status to improve their overall health, nor run in an endurance race, join a team, or order the latest set of extreme fitness DVDs. It can be as simple as talking a daily brisk walk, riding a bike, taking a few laps at the local pool, or finding a free outdoor fitness park and exercising at one’s own pace. The key is to make it enjoyable so the behavior is repeated. This may take several attempts to discover, but with so many options, there is most certainly something for everyone. It’s boring or I just don’t care for it. If this is your opinion of exercise, you haven’t found the right thing. Brisk walks while listening to music, biking, dancing, joining a team, obstacle racing, gardening, skating, playing catch with the kids, doing agility with your family dog, there are so many options! If it’s not done sitting and it elevates your heart rate, it’s exercise! Don’t let preconceived notions define what you consider exercise; just get moving. Does it make your joints ache? Try swimming or cycling. Do you hate to get sweaty? Find an indoor activity. Do you get lonely exercising or lack motivation? Find a local boot camp, yoga class, or dance team to get group dynamics and encouragement. Whatever you try, give it time. Behaviors aren’t changed overnight, and it may take several weeks before the activity feels enjoyable, or part of your regular routine. I don’t have time. To address this concern, write out what you do each day. Yes, everyone leads busy lives, but carving out 30 minutes a day should be easily attainable. Do you watch TV at night? Television and video games are the predominant form of “resting” for most regular families. Thanks to the Internet, television, live streaming, social media, texting, and an abundance of video games, people are becoming more and more sedentary. 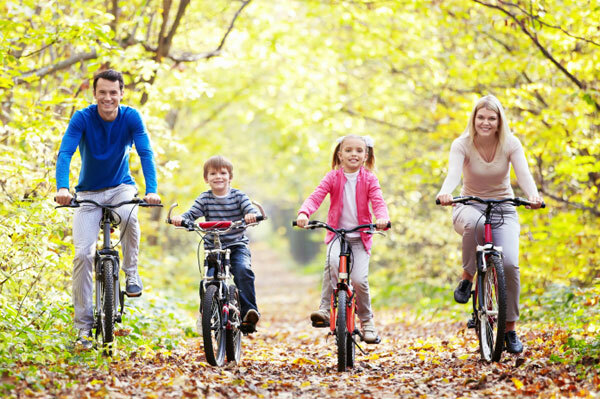 Families can all benefit by getting active instead. Sitting at a desk all day, whether in school or at work, should not be followed by more sitting at night. Find the time to get active; it’s always worth it. I’m too tired. Working out actually gives you energy as your body produces endorphins and circulation is increased. Experiment with different times of day. It might make sense to get up 30 minutes earlier and start your day with exercise to increase productivity throughout the day. Try taking a walk at lunch, or bike to and from work. Remember, your daily exercise does not need to be all at once to be beneficial. I can’t leave the kids alone. Take them with you! Head to the park, the local playground, and/or schedule family meet ups with other families. It’s much more beneficial to exercise with your children. You reinforce the importance of exercise, create fun memories that children are likely to emulate when they become parents, and instill exercise as a regular behavior. 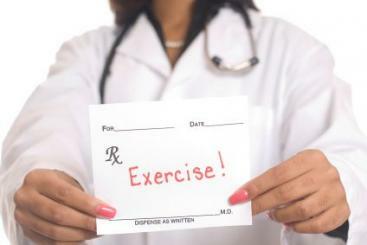 If you’re struggling with regular exercise as an adult, you know how beneficial that can be! It doesn’t work for me. Don’t give up! This one is especially common when people are trying to lose weight. The right combination of exercise and nutrition are critical. Keep a journal. If you stop exercising for a while due to injury or a break in the routine, pick it back up. Good or bad habits aren’t formed in a day or even a week. Just keep at it! I don’t want to be all muscular.Surprisingly, very few people do. That middle-aged woman swinging the kettlebell? She wants to be able to pick up and play with her grandchild. The elderly man in yoga class? He wants to ensure he maintains good posture and balance to avoid potential falls and resulting injury. Unless you are specifically training to build oversize muscles, it won’t happen just because you are exercising, even when you use weights. What it WILL do is increase functional fitness. The ability to go through a normal day, run for a bus, carry several bags of groceries, play with your pet, comfortably bend over to tie a shoe, all are more easily and comfortably achieved as a result of exercise to help us stay fit and limber. No matter what our age, we all benefit from exercise. Without it, we are adversely affecting our health, our long-term ability to move independently, and our children’s ability to balance healthy activity with sedentary behavior. Call it play, call it exercise, call it fun, call it whatever you like, but make sure you make time with your family to get active. Our very lives depend on it. While I realize (statistics indicate) the average American can stand to lose a few pounds, the scale doesn’t always tell the entire story. Your body weight is not a reflection of your worth. It’s more productive to focus on eating clean (and not overeating), exercising, improving strength and mobility, increasing energy, and NOT a number on a scale. There’s not necessarily a definitive relationship between body weight and overall health. 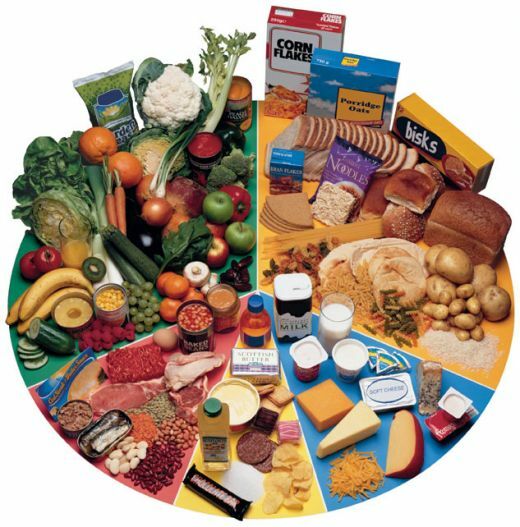 A person can have a healthy body weight, yet eat (qualitatively) poorly and be relatively physically inactive. We don’t do a lot with scales and body weight at our facility. We would rather concentrate on how people feel, function, and perform. Keep in mind muscle takes up less space but weighs more than fat. “Healthy” is not limited to any particular shape, size, or weight. At least some of that is determined by genetics, anyway. Part of the problem is our referent. We try to compare ourselves with others — unfairly and unrealistically — instead of aspiring toward self-improvement: being better today than we were yesterday. We all want to look and feel good, but the fads and gimmicks we chase to get there are not the answer. In simple terms, eat cleaner, eat less, be more active, and exercise more. An examination of ounces and pounds shouldn’t start your day any more than it should end it. Don’t let the scale deflate your efforts if you know you’re on the right track with your nutrition and exercise plans. Even if weight loss is part of your plan (and it’s okay if it is), detach the number on the scale from how you feel about you. Be fair to yourself, eat well, stay active, and stay on track. I try to exercise six days a week, usually by strength training (4 days) and playing basketball (twice weekly). Since I workout at the facility I own and operate, there’s rarely an excuse to miss a day (not that I haven’t). But basketball isn’t always an option, since our group plays at the local middle school. When school is not in session (holidays, summer, etc.) the gym is closed, which means no basketball.